Mac is growing on me as a transformed woman coming from a pink girl, if you know what I mean. The transition is immense, her sense of protection and therefore her Sidhe-seer side is really coming out and Mac and Barrons seem the only ones to be realising what the threat is and not caring much about on what side you are on. Rowena – something is on there… I don’t trust her at all! How could she have lost it, not protecting Mac when needed and grounded the rest of the Sidhe-seers! I love Dani, but her cussing needs to stop. But then again she’s trying what is needed to be seen as an adult and not as an almost 13 yr old girl. They treat her like a little girl unless it has something to do with killing Fae… then she suddenly is the adult till Rowena steals her weapon away from her again. Barrons, I really really like him. I wasn’t sure what to think of him in the other 2 books at first. But man…. He’s fab and has got Mac’s welfare on his mind, If he wants it to be or not. No one is not bothering to protect Mac and Barrons is doing that in the only way he’s capable of or knows as I think no other woman has so far been able to make him feel like this. I try to do most reviews spoiler free – but I do need to write the following down…. Eating unseelie?? DAMN!! And Malluce dead, finally! And who is LM!! I want to know! Anyways, not really a shocker to see Fiona making an appearance here or O’Bannion. I am glad Mac has found a way to Jayne see the things that are going on in Dublin – again in the only way to know how. Mac is brave, really brave and knows and understands exactly what needs to be done. Not bad for someone who’s almost an outcast in her own kind with no knowledge of her abilities till she stared to look for her sister Alina’s murderer. Karen Marie Moning does know how to write an ending… BAM! Thankfully I do have the next book!! Up to Book 4 – Dreamfever now! 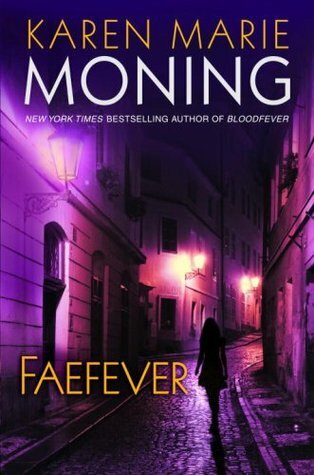 Read an excerpt of Faefever here!